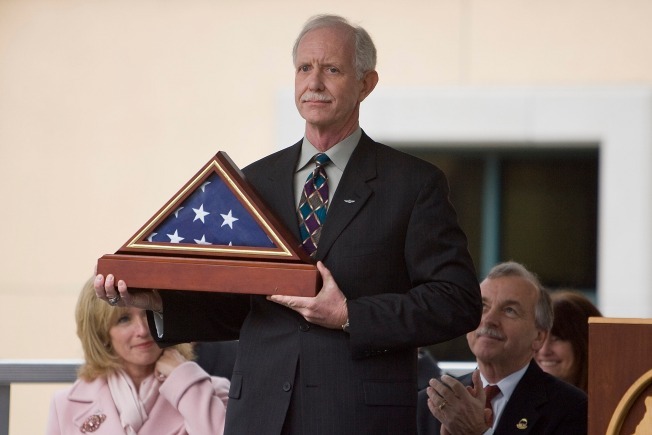 US Airways pilot Chelsey B. Sullenberger III holds up an American flag that was presented to him during a celebration in his honor January 24, 2009 in Danville, California. The Hero of the Hudson is getting another big honor this weekend. US Airways pilot extraordinaire and holder of the key to Danville, California Chesley "Sully" Sullenberger will be honored by the NFL before the Super Bowl. Sullenberger, along with the rest of Flight 1549's crew, which includes co-pilot Jeffrey B. Skiles and flight attendants Doreen Walsh, Sheila Dail and Donna Dent, will be recognized for their life-saving work before the start of Sunday's game between the Arizona Cardinals and Pittsburgh Steelers. Sully was praised as a hero for his water landing Jan. 15 on the Hudson River in New York after both the plane's engines were disabled following a collision with a flock of birds. All 155 passengers and crew members survived. This is Sullenberger's second honor — thousands came to Danville, CA. last Saturday to welcome home the magnanimous hero. Sullenberger told the crowd circumstance determined he would be flying with an experienced crew on that day. "We were simply doing the jobs we were paid to do," he said. About 3,000 people gathered under drizzly skies in the town square to welcome Sullenberger home. The lawn was festooned with American flags, and some people held signs with messages including "Way to Go" and "Sully, Danville's hero." Sullenberger's brief comments there were his first public remarks since he brought Flight 1549 to an emergency river landing in New York City. He also was invited to attend the inauguration of Pres. Barack Obama, but did not make any public appearances during his visit to Washington, D.C.
One tabloid show did get a snap shot of him at a D.C. restaurant called "The Hudson." Kick-off for the Super Bowl is at 6 p.m. EST, the flight 1549 portion will come at some point during the pre-game festivities.